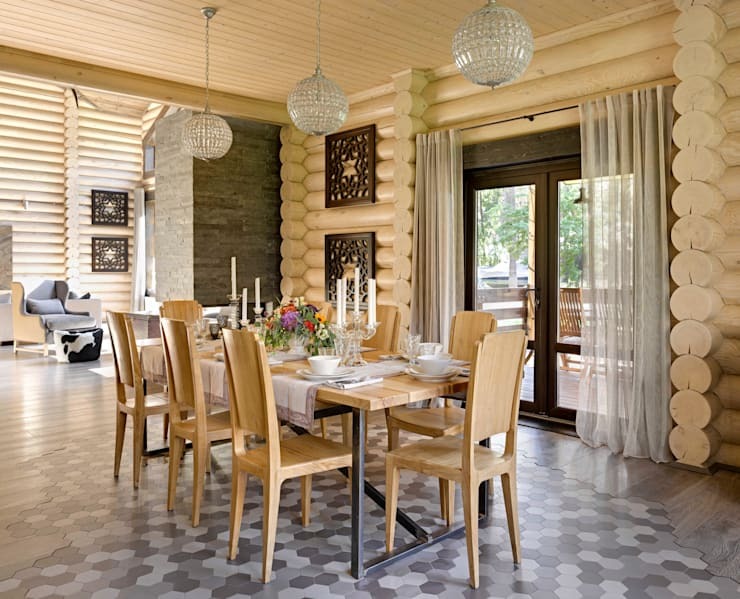 Get ready for some serious country style, as this contemporary log cabin located in rural Russia as absolutely unforgettable! 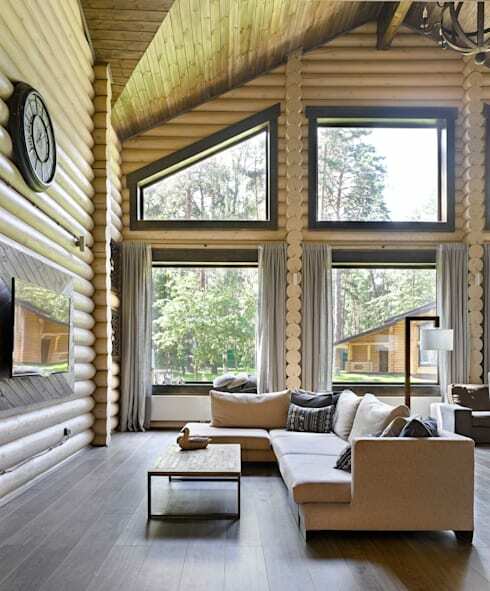 The brainchild of Moscow's Lavka Design, this home showcases a stunning blend of rustic, country and modern aesthetics, all framed within sturdy and lofty log walls. Upon entry we're presented with an open living area, combining living, dining and kitchen spaces, each decorated to display a unique sense of character. The living spaces are stylish and inviting, and subtly sectioned into two parts, one for relaxation in front of the television, the other in closer proximity to the home's contemporary fireplace. Bordering these areas are the dining room and kitchen, which exude luxurious, country style through their use of wood and crystal furnishings and finishes. Perhaps the most striking elements of this amazing abode however, are the distinctly designed bedrooms and bathrooms, with each space infused with its own unique persona while staying true to the blend of country and contemporary styles prevalent throughout. This design definitely sets the standard for luxurious, relaxing rural getaways and provides plenty of design inspiration! Take a tour below and tell us what you think. 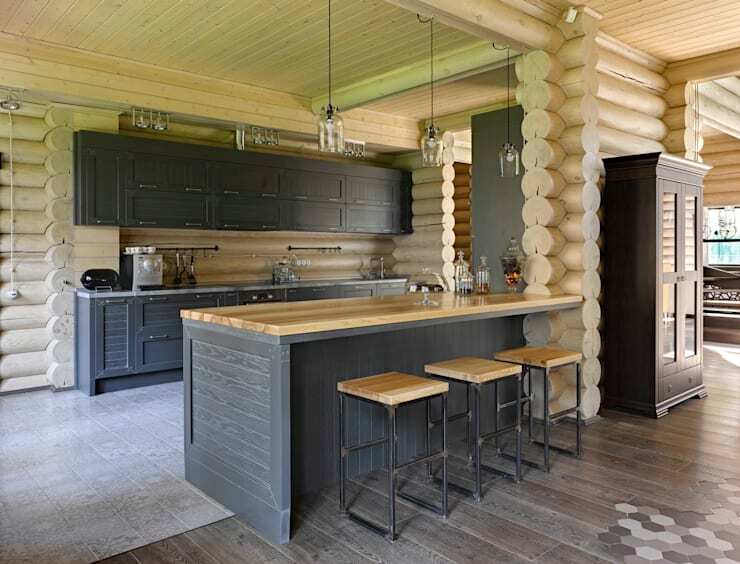 The interior of this brilliant abode blends elements of traditional, log-cabin living with stylish, contemporary design features. 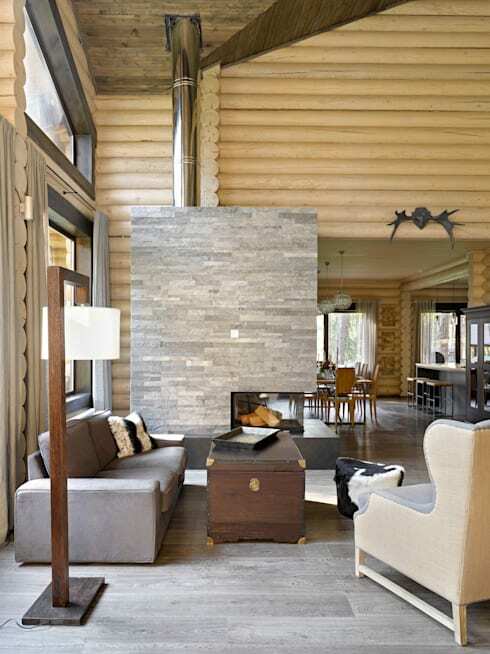 The pale wooden finish of the log walls provides a constant reminder of the foundation of this design concept, with the interior populated by a range of furnishings such as the modern armchair and chaise seen here, and striking features like the free-standing fireplace lined in grey stone. The aesthetic within the home appears luxurious and relaxing, with its furnishings and finishes presenting an enticing allure. The living room has been divided into two sections, delineated in subtle style by the placement of the furniture. This section demonstrates the synergistic blend of country and contemporary styles on display throughout the home, with stylish, modern furnishings intertwined with hints of the its rural locale. The cowhide footstool seen here presents one such example, as do the mounted deer horns atop the doorway, which leads through to the home's expansive kitchen and dining rooms. This section of the living space houses an expansive and comfortable lounge suite, situated to accommodate relaxation in front of the television, while the area behind has been designed to better capitalise on heat emanating from the fireplace. Light streams into the home though its array of large windows, beautifully illuminating the soft, pale tone of the wooden walls and the range of stylish decorative elements included within. The home's kitchen brilliantly combines elements of rustic and modern style to produce a unique, casual space. The kitchen has been completely constructed of wood, with the material emanating an air of country style, while the storage spaces have been painted a more contemporary, cobalt grey. The pale tone of the counter tops provides just the right colour contrast, with the entire space appearing relaxing and inviting, just as a country kitchen should. Moving through to the dining room and we are presented with a lovely space that has been beautifully decorated to accommodate an intimate, country-style party. A simple dining setting in wood lays the foundation for this beautiful scene, while geometric tiles in a range of cool, grey tones flow underfoot, delineating the dining area from the living room and kitchen. Sunshine flows in through the patio doors, bathing the space in a soft glow, while three spherical, crystal lights hang above the table, ready to provide evening ambience. When viewing the home's bedrooms it's evident the designers have sought to infuse each with its own, unique sense of character. This bedroom is bathed in soft light, which filters through a large window to beautiful effect. A rustic, iron bed rests pride of place within the space, with a vintage, crystal chandelier hanging overhead for a hint of majesty alongside the bed's finely embroidered linen. A contemporary chair sits next to the window, providing another vantage for relaxation, while colour has been introduced through the inclusion of a vibrant throw rug and tapestry. The bathrooms within the home present equally distinct designs, with this expansive space decorated in bold and striking black. 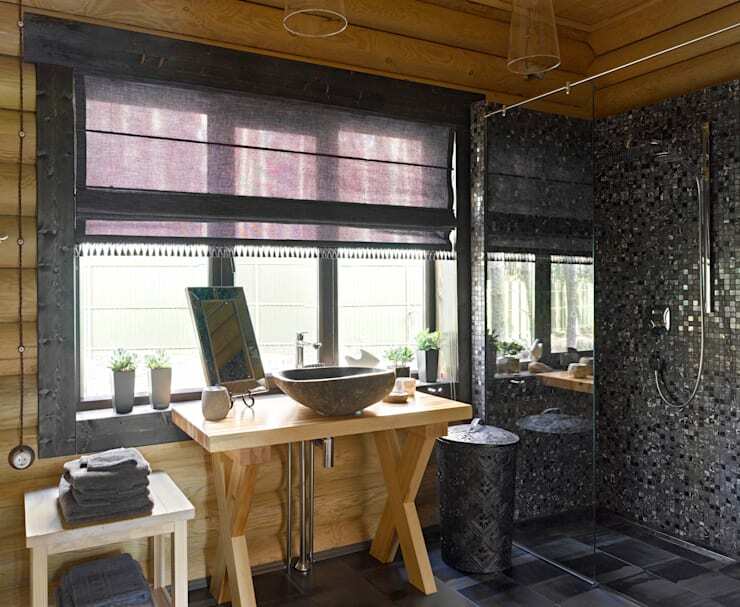 The sheen of black tiles, both large and small, contrasts brilliantly against the pale timber of the log walls and ceiling, creating a unique blend of aesthetic styles and materials within this luxurious space. A stone sink perches atop a simple, wooden table, with a small, art deco mirror included nearby for understated functionality. This bedroom presents a complete stylistic departure from the design of its predecessor, with the delicate, ornate hints of majesty previously seen replaced by more masculine materials and a darker colour scheme. 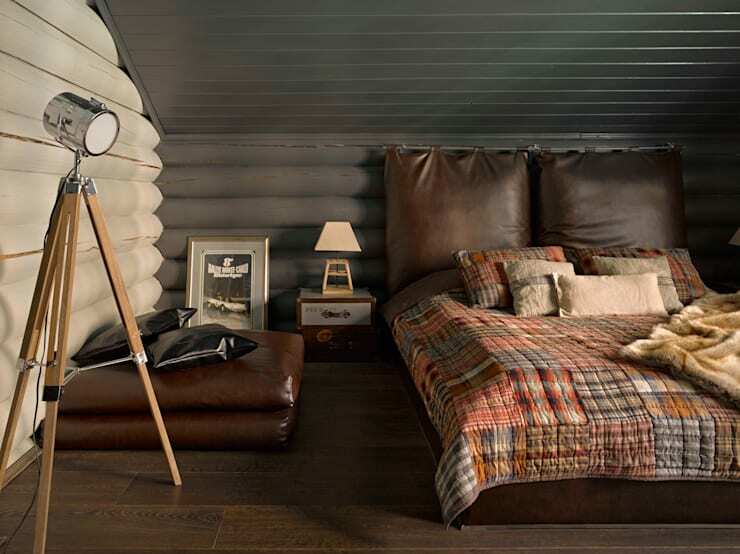 Luxurious leather defines the bed and large cushions, with a rustic quilt and fur skin adding a sense of warm, rural vibrancy. The walls of this room alternate between white and cobalt grey, creating a cosy atmosphere beneath its slanted ceiling, while a contemporary spotlight has been included for localised illumination after dark. Finally, we are presented with this beautiful bathroom, which is resplendent in its relaxing, indulgent style. 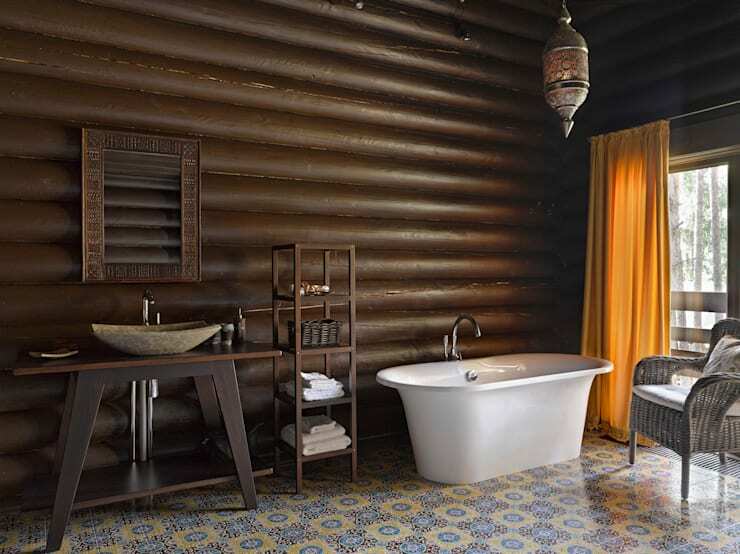 The log walls in this space have been painted a dark brown, which provides a deep contrast against the intricate, decorative tiles lining the floor. Light flows in through the terrace doors, illuminating the bathroom and displaying a lovely view of the home's rural surrounds, which can be admired from the comfort of the contemporary bathtub. The sink unit in this space is presented in the same manner as its predecessor, with a rustic, stone bowl poised atop a wooden table, conveying a simple and intriguing approach to this bathroom necessity. Are you a fan of stylish, modern holiday homes? If so, have a look at A Contemporary Cottage by the Lake for more inspiration! 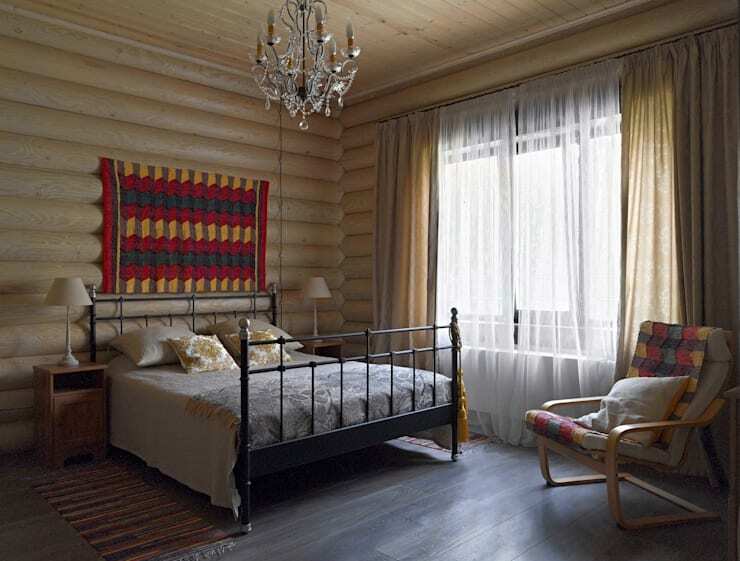 Do you like the blend of styles within this luxurious log cabin? Tell us your thoughts below!